Abounding Grace El Cerrito is excited in your interest to worship with us in one of our weekly services. We are a community of down to earth people from all backgrounds and ethnicities who join together to celebrate the resurrected Christ in song, worship and preaching. Please make sure to stop by our ‘Guest Center’ after service with your Connect Card to receive a gift for visiting us. We would like to send you home with with a gift bag from Pastor Jeromy and the Abounding Grace family. The Abounding Grace ministry staff and church family are so excited to meet you and show you first class hospitality. We are driven by a passion for people and fueled by our transformational experience through the gospel of Jesus Christ! Our Sunday Celebration Service is an exciting opportunity to worship freely and allow Gods word to come to life in us. After service, feel free to join us for refreshments in the fellowship hall. In our Sunday School class, the children are lead through a Bible adventure with exciting games and interactive lessons. Our children are dismissed for Sunday School just before the preaching. At our Mid-Week Bible Study, we take an in depth view of scriptural history and principles. In this class we slow down to learn the ways of God so that we can strive to live like Christ while leading others to a life of hope. 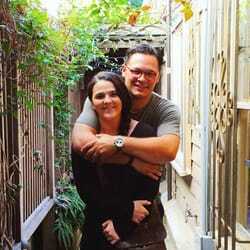 Jeromy & Bethany Hogue have been serving in the ministry of Abounding Grace for over ten years. In September of 2014, Bishop Morgan and Abounding Grace launched the El Cerrito Campus with great expectation for a thriving church in the East Bay. If there is no street parking available, you can find extra parking in the Marshals Shopping Center across the street from the sanctuary.